Welcome to the Gweduck Amphibian Flying-boat! Welcome to the new Gweduck website! The Gweduck is an experimental, twin engine flying-boat style amphibian of composite construction and is reminiscent of the Grumman style aircraft. Aircraft development started in the early 1990's and has focused on a broad range of issues including aircraft performance and handling as well as manufacturing technologies. With several hundred flying hours on the prototype airframe, the Gweduck is now going into production as a kit-built aircraft! For more information on the Gweduck please fill out our questionnaire (Click Here). The Gweduck design project was started to recreate a Grumman Widgeon but using composite materials to eliminate the extensive corrosion and maintenance problems so common to the 40+ year old design. Over time the project developed into a ground-up redesign of a completely new aircraft that combines the knowledge and experience of 1940's & 50's flying boat designs with modern composite construction, and the latest in aerodynamic and hydrodynamic technologies. 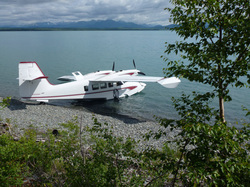 Please take a look at our our website to learn more about this outstanding amphibious flying boat! Ellison - Mahon Aircraft, Inc.